Ashkelon Magistrates' Court ruled Thursday that the head of the northern branch of the Islamic Movement Sheikh Raed Salah and another three Israelis detained in the Gaza flotilla raid be released to house arrest. Salah and the other detainees will remain in house arrest until Tuesday and will post NIS 150,000 (about $38,600) in bail. In addition, they are banned from leaving the country. The court accepted that police request that the men be released to house arrest, contrary to their lawyers' request that they be released without conditions. 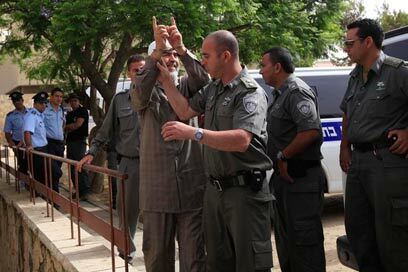 Prior to the hearing, Salah claimed, "IDF soldiers tried to kill me. They fired in the direction of someone else they thought was me." Sheikh Salah, who was onboard the Marmara, was arrested with three other senior Arab officials who took part in the pro-Palestinian flotilla. "Seizing (of the ship) is completely a crime," he said. "I am prepared to die for God. It is our right to defend ourselves; it is our right to help the weak. We were on a ship under Turkish patronage, and they need to help us." On Tuesday, Ashkelon Magistrates' Court Justice Dina Cohen extended the remand of the four detainees by a week. In her ruling, she said that she is convinced that releasing the suspects will lead to a disruption of the investigation proceedings and will endanger public safety. Salah smiled a lot during that hearing and waved hello to his many friends who arrived at the courthouse. A short time later, a riot broke out. The courtroom proved to be too small to contain all the journalists and civilians. As such, dozens of his supporters were forced to wait outside the courtroom together with his family, who were displeased by this turn of events. Salah's lawyer, Attorney Orna Cohen, claimed that the detention of the four suspects is unlawful. "When they were arrested on the boat, no request to arrest them had been issued, and, as such, their liberty was negated when they were not allowed to meet with a lawyer," explained Cohen. See all talkbacks "Raed Salah released to house arrest"